Tormentor667 wrote: Another question towards this brilliant work: When entering "Treasery", I get the message that I have insufficent memory to playback music. What can I do here? You can Reset the music by hitting F1, after loading a level with no music playing, and it will start after exiting the Help screen. B) Or if you're Running Dosbox By adding more Memory in a configuration file. 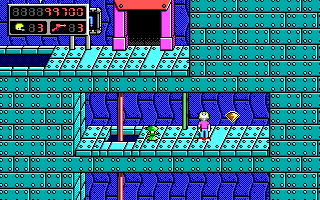 Okay, the ice cannon is working now but I still have the memory issue. Can someone share his version of CK5 with which it is workin? Or maybe a different DOSBOX config? stunning yorpy Yorps. that's sweet. I have a few minor nitpicks concerning the Yorp's behaviour. @Levellass... which of the following might be viable? furthermore the sound of stunning only appears in whole length when touching them while jumping. head-hopping will sadly interrupt the soundfile. also comparing to K1: pogoing Yorps disables the pogo. implementation possible? refreshing time is 4 sec? give em 5! I did figure you'd want some adjustments. 1.) Don't know what you mean by that one there. 2.) It is possible to produce a more precise bopping if you'd like, will take until I have more free time. 4.) 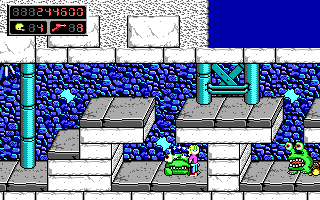 The slipping is a bit of a bug in Keen 1, implementing it in Keen 5 would be tricky. 5.) I can also make Yorps disable Keen's pogoing. This part of the patch, specifically the $10, controls the stunned time, making it larger will make the Yorps take longer to unstun. $0014W is 5 seconds I believe. Aaah, you want them to jump a bit? That can be done, not sure if I mentioned it but the patch frees up some space to make the Koraths bounce around. Dr.Colossus, thank you so much for this. I love this game! Last edited by NewKeen on Fri Dec 16, 2016 2:25, edited 2 times in total. is there a reason for collecting that yellow key in the Ice Shrine? and what about that secret "exit"? No, there is no reasen to collect the gem. It's just like in the original game. I see... think I need to consult K1 again for some closer inspections. it's been a while... obvious! but nevertheless, I again enjoy playing this mod very much. oh, that's so bodacious. I even can remember when I told my friend this trick back then. He came over to my house and we both played this very level over and over again, looking for more single placed pixels. what an excitement! sweet, sweet memories! In contrast to other games, in the Galaxy series there are no floating Areas (like the Platforms in Mario). And that's one big reason why I like the Keen games so much. So I had the option to make an ice cave level or the cloud platform variant. Yes. But the walls didn't look good when I first tried that out. The spawn hight of the raygun is a bit differnt to K1 and it was always a bit weird. 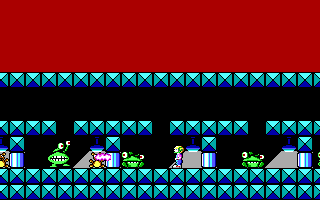 But in contrast to the original game, in the galaxy versions Keen can shoot downwards while jumping. So I thought this would compensate this situation. It's taken forever but I've finally finished a track designed for the final level! You can download it here and if you like it you can go to my Soundcloud and give it a like/repost. BlueGasMask wrote: It's taken forever but I've finally finished a track designed for the final level! Every level should feature Too Hot.